So, yeah. 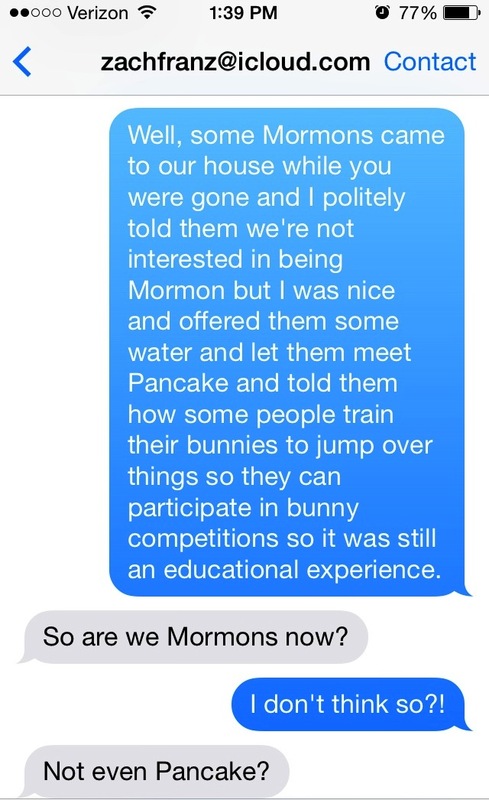 Pancake might be Mormon now. It’s hard to tell. Because she’s a bunny. And I decided when we first got her that she is Jewish. But whatever, her religion is her choice, not mine. Lol! Omg this is gold! Hahaha! Haha, glad you enjoyed it! Thanks for stopping by! Well, you did it again. Made me laugh out loud and read it aloud to John for a second chuckle :). OMG lady! You are awesome 🙂 I think we all need to see a picture of Pancake so we can assess her religious leanings–more out of curiosity than judgment. PS: I TOTALLY thought of you yesterday. I took my pooch for a 7 mile run and we encountered at least a dozen squirrels along the path. I’m happy to say that none were hurt in the process, but my arms and knees are killing me today from holding that 80 pound beast back! The squirrels totally just meant for you to get an extreme workout! And maybe to taunt your dog, too. They’re squirrely like that. Yes, of course. They must have known about the extra cookies and brownies I had on Saturday night!! My ‘pet possum (very large and aggressive squirrel)’ is definitely not a Mormon, although he may have a bit of an interest. He takes solitude in my bedroom wall and only de-camps when his fast has concluded. 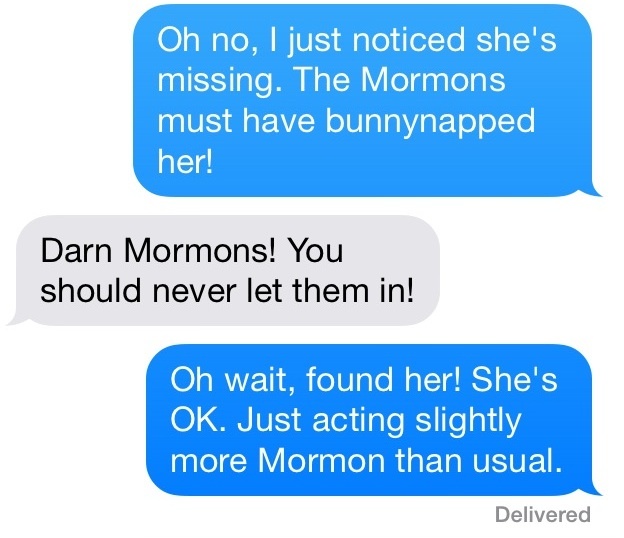 A Mormon rabbit? Well,that’s funnier than the parrot called ‘Terry’ who thinks of himself as a dog. I have no idea what you’re talking about, but I like it. I’m going to meet this parrot some day. Thanks for stopping by! of his site, since here every data is quality based material.